Reprinted here for the first time since the 19th century, these color illustrations by T. Pym make the classic Andersen fairy tale even more magical. 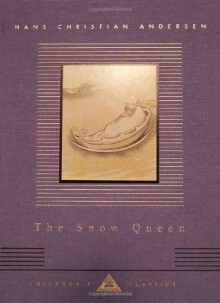 One of Andersen's best-beloved tales, The Snow Queen is a story about the strength and endurance of childhood friendship. Gerda's search for her playmate Kay–who was abducted by the Snow Queen and taken to her frozen palace–is brought to life in delicate and evocative illustrations. http://ThemisAthena.booklikes.com Themis-Athena's Garden of Books 4.5 The Twelve Tasks of the Festive Season -- Task the Eleventh: The Polar Express, Part 2: Hans Christian Andersen, "The Snow Queen"
text The Twelve Tasks of the Festive Season -- Task the Eleventh: The Polar Express, Part 2: Hans Christian Andersen, "The Snow Queen"
How I feel after reading this. I have no idea what the moral of this fairy tale is.